Pyramid Rock, composed of black basalt columns, in the distance sits on a pink granite outcrop. Images courtesy of Tas Walker. One remarkable tourist highlight on Phillip Island, near Melbourne, Australia, is Pyramid Rock, which presents a distinctive silhouette against the Southern Ocean. You can see its black triangular shape from most of the beaches and headlands along the island’s southern coast. 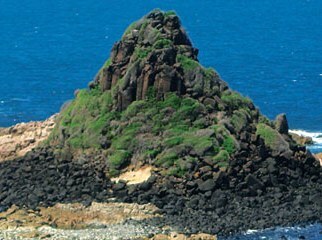 The basalt outcrop in the foreground on Phillip Island itself and the pyramid in the ocean were once connected, but the intervening rock has been eroded away. You can judge something of the depth of a single lava flow from the length of the columns. As you look at these rock outcrops imagine the extent of the lava flow and its depth. Imagine, too, the huge volume of basalt rock that has been removed by erosion since the rocks solidified. This is just one of many lava flows stacked one upon the other that is visible on the island. 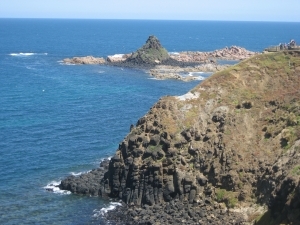 Interpreted geological history of the Pyramid Rock unconformity on Phillip Island. The granite was emplaced early in the Flood, when the previously deposited sediments were compressed and uplifted. Significant erosion by continental scale floodwater movement removed the country rock and, during the Recessive stage of the Flood, the Older Volcanics were erupted. In geological terms the contact between the underlying granite and the overlying basalt is called an unconformity. It signifies a time gap between the granite being emplaced and the basalt lava flowing on top. It’s from sites like this that geologists conclude that lots of erosion occurred between the time the granite was emplaced and when the basalts were erupted. Unlike basalt, granite magma does not flow over the surface of the earth but accumulates far underground in magma chambers, perhaps at a depth of a kilometer or more. 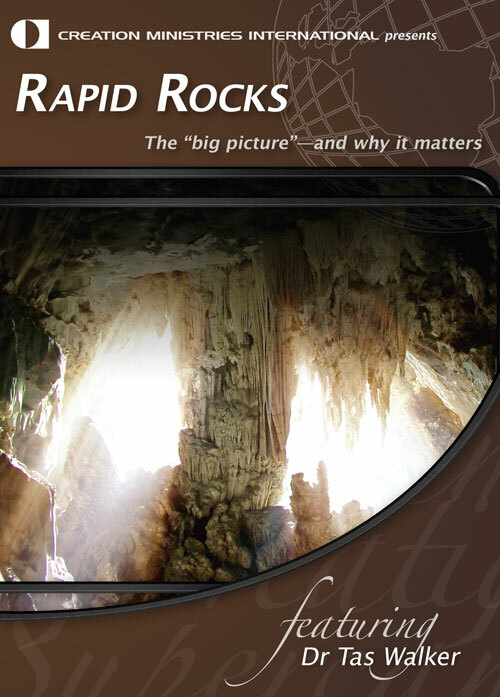 So for the granite under Pyramid Rock to have been exposed at the surface, the sedimentary rocks into which the magma had intruded and which sat on top of the granite had been eroded away—likely kilometers of material. Most geologists imagine that this occurred over hundreds of millions of years by slow-and-gradual weathering, such as we observe today. 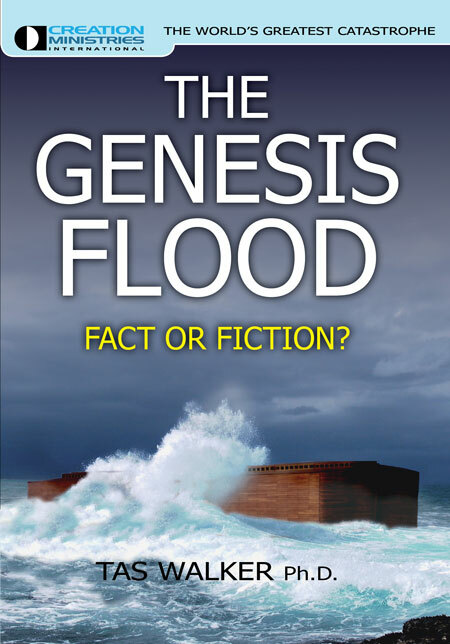 However, continent-wide movements of water during Noah’s Flood not only account for such erosion but explain how it could have occurred within weeks or months. This coarse, sandy/gravelly material is composed of slightly angular quartz fragments and a whitish clay called kaolinite. It’s typical of sediment produced from the breakdown of granite, and most likely was derived from erosion of the Woolamai granite. It was deposited from flowing water. In other words, the basaltic lavas not only erupted after a huge amount of erosion had already taken place but also while erosion was still occurring. In places the basalt lavas flowed directly on top of the granite, in other places on top of sandy sediments, and in yet other places sandy sediments washed over the top of the lava flows. 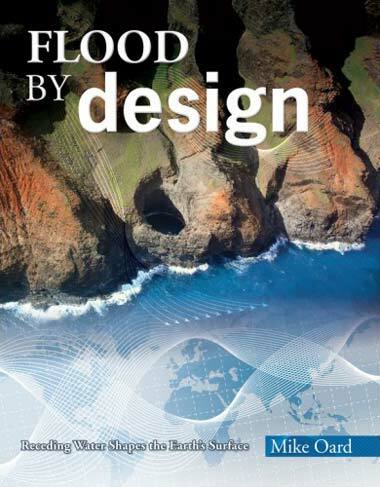 It’s a feature that is easily explained within a Flood framework. Within that perspective, the granitic magma was intruded into sediments deposited early in Noah’s Flood as the waters were rising on the earth. It was the compression and folding of the sediments that generated the granitic magma and emplaced it within the earth at that time. After the floodwaters peaked and the continent of Australia began to rise relative to the ocean, the stress along the margins of the continent led to the eruption of the black volcanic lavas. These erupted over the surface as the floodwaters were receding from the continent into the Southern Ocean. Pyramid Rock unconformity, 20 July 2009, www.dpi.vic.gov.au/dpi/vro/portregn.nsf/pages/port_lf_sig_sites_pyramid. Return to text. Mines Department Victoria, pp. 1–3, 1977. Return to text. Cape Woolamai—Granite Tombolo, 13 April 2011, www.dpi.vic.gov.au/dpi/vro/portregn.nsf/pages/port_lf_sig_sites_cape_woolamai. Return to text.